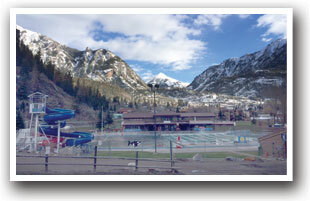 OURAY is a quiet little community wedged tightly into a portion of the Uncompahgre River Valley. Named for a Ute chief, Chief Ouray was responsible for keeping peace between the Europeans and Native Americans in the southwest region of Colorado. Later settled as a mining town in the 1870's, the area contained rich deposits of silver and produced over $20 million in gold. Tourism and mining still support the town today. A newspaper once published "Ouray is to jeepers what Oahu is to surfers." The four wheeling roads often follow sheer drops and cut into cliffs, and the scenery is some of the best. The Alpine Loop covers 65 miles of roads between the towns of Lake City, Ouray, and Silverton. Depending on winter snows, the Loop opens in late May or early June and closes in late October. Give 1-2 days to cover all the byway has to offer on either an ATV & 4 wheel drive vehicle. Cross country skiing is also popular, especially around Red Mountain Pass. Be sure to take one of the many mine tours, visit the historical museums, Box Waterfalls, and the hot springs. 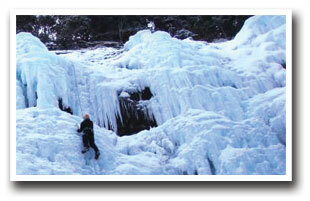 Also visit the Ouray Ice Park, a center of ice climbing, climbing is free. In January, go to the Ouray Ice Festival where exhibition climbing, free clinics and gear demos take place. The Ice Park also provides a beginner's climbing facility, the School Room, where beginners can receive instruction from local climbers. RIDGWAY is nestled between the verdant San Juan and Uncompahgre National Forests with the rugged San Juan Mountains serving as a dramatic backdrop. Rich in ranching history and scenic beauty, Ridgway offers something for everyone. Recreational activities, including hiking, 4-wheeling, boating, fishing, hot air balloon rides, cross-country skiing, swimming, and rafting. The San Juan Skyway begins its southerly route on US Highway 550 in Ridgway, offering scenic views of emerald pine and golden aspen forests at every turn and ending in Durango. 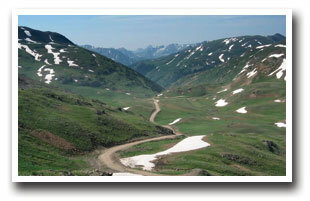 The Byway covers 236 miles of terrain across southwestern Colorado. 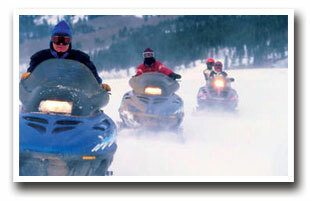 Ridgway Snowmobile Trails offer snowmobilers a chance to discover just why the San Juans are the most photographed mountains in the world. The Owl Creek Pass trail takes riders up 10,114 feet into the peaks to enjoy the breathtaking views and scenery the mountains offer. Campground along the Uncompahgre River in Ouray. Same Family (4J+1+1) ownership for OVER 60 YEARS! Cross the foot bridge from your RV site to the public hot mineral springs pool, dining and shops. Wedding Destination! Image your wedding pictures featuring spectacular Ouray County mountains: indoors, outdoor, formal, casual, large, small, fairgrounds, we offer you the perfect center for your event. 5-mile long reservoir near Ouray, surrounded by mountain scenery. Ridgway State Park: 283 campsites, 3 yurt/tents, swim beach, nature trails, fishing, gift shop, nature programs. GROUP EVENT FACILITIES. Walk to restaurants in Ridgway. Non-smoking lodge with spacious, well-appointed rooms and suites near Ouray, CO. Enjoy mountain views, continental breakfast, and Free WiFi in every room, indoor pool.